Do you want to be a JFM vendor? – Here are some tips. Maybe you are a farmer or producer who is considering selling at a farmers market, but you don’t know where to start. Here are some tips and ideas to get you started. The Janesville Farmers Market is a fun Saturday morning event with a close-knit community of vendors. Vendors come to the market for many reasons. Selling products directly to consumers is just one of the reasons. Many vendors want to form relationships with local customers and sell their products at a fair price. Some vendors also come to the market as a social occasion. They enjoy talking to their fellow vendors and meeting both new and regular customers. Do you make or grow something that is needed at the farmers’ market? Do you enjoy interacting with people and offering good customer service? Then selling at the Janesville Farmers Market might be a good fit. Our market brings in 2,000-3,000 customers on a typical Saturday morning. 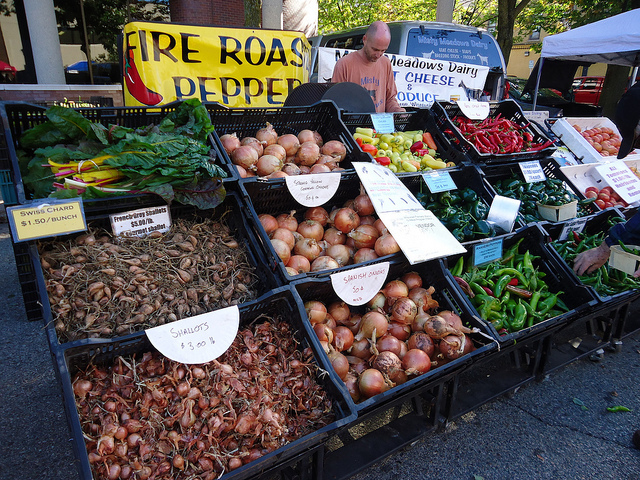 Most of the customers are seeking local farm products. Some may wish to purchase gifts and artisan products. A few regulars make a weekly social trip to the market to meet friends and family. Entertainment and special events round out the market experience for customers young and old. Our market offers something for everyone. If you are unsure about whether there may be a need for your particular product, you may also call or email the market manager. For the 2015 season, JFM is focusing on recruitment of farm vendors and prepared foods. We are especially in need of ready-to-eat foods, eggs, meat, early and late-season produce, unique farm products, nuts, grains, dried beans, maple syrup, wool/fiber and fruit (pears, apricots, peaches, blueberries, cranberries, grapes, currants). 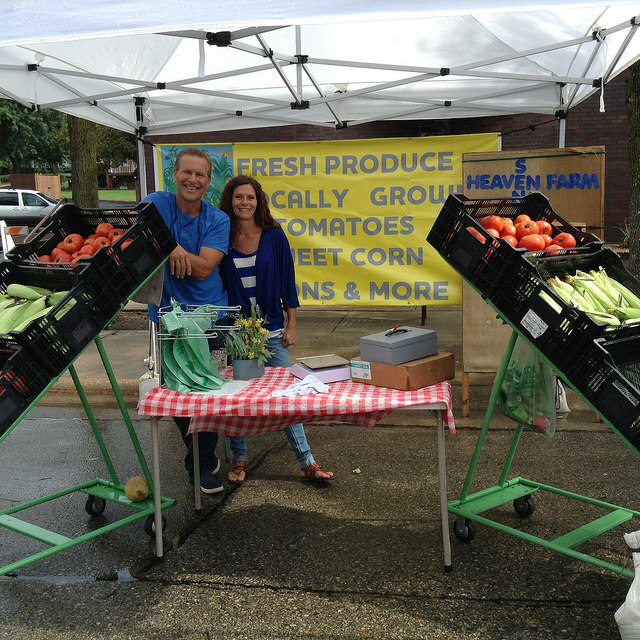 Janesville Farmers Market offers Seasonal, Partial Season and Daily vendor options. The Daily option is a great way to try the market out for the first time and decide if it is a good fit for your products and personality. If you know that you will vend at least eight times in the season, you will want to invest in a Seasonal stall in order to keep the same location throughout the season. Daily vendors may be moved around from week to week. Janesville Farmers Market stalls are 10 x 10, which is a common size for shade tents. Vendors must provide their own tents and tent weights. Because our West Wall Street location is very sunny, very few vendors choose to spend the day outside without some kind of shade protection. Whether you choose to use a tent or a large umbrella, weights are required. JFM will not be responsible for damages caused by improperly weighted tents. We recommend at least 25 pounds on each leg of the tent, attached securely by rope, tape or bungee cord. Some ideas for tent weights include: dumbbells. concrete blocks and plastic jugs filled with sand or water. Your display should look welcoming and abundant. If you don’t have enough produce to fill a bin, use paper or cardboard to prop up your veggies or use a shallow basket and perhaps angle it. Table coverings can be used make your display look nicer and set your booth apart from other vendors. Use vertical space, colors and signs to catch the customers’ attention. If a ten foot wide display sounds small to you, consider using a U-shaped design that allows customers to walk into your space to view your products. You can also find creative ways to utilize your vertical space. If absolutely necessary, vendors may request and pay for a second stall. One experienced vendor likes to purchase two spaces and put her 10 x 10 tent in the center of the spaces in order to provide room for multiple products and allow customers to walk around the outside of her display. Customers appreciate signs that are clear and accurate. Please mark the prices clearly on or near your items. Use signage to build a relationship with customers and inform them about your farm or business. Make sure statements are honest and accurate. For example, do not use the word “organic” unless you are certified. Instead, you may say “Grown without Pesticides” or “Chemical-free” to let customers know that you didn’t add artificial inputs. Consider using a sign with your logo and business name to make it easier for customers to identify you in a crowded market.